In a medium skillet, heat 2 Tbsp oil over medium-high heat. Add the onions and peppers and cook until soft. Set aside. In a large skillet, heat 2 Tbsp oil over medium-high heat. Add the meatless crumbles and garlic. Sauté for 2 minutes, adding salt and pepper to taste. Slowly add the red wine to the crumbles. Cook, stirring regularly until wine cooks down and crumbles are saturated and juicy. Remove from heat. Place one slice of cheese in each roll. 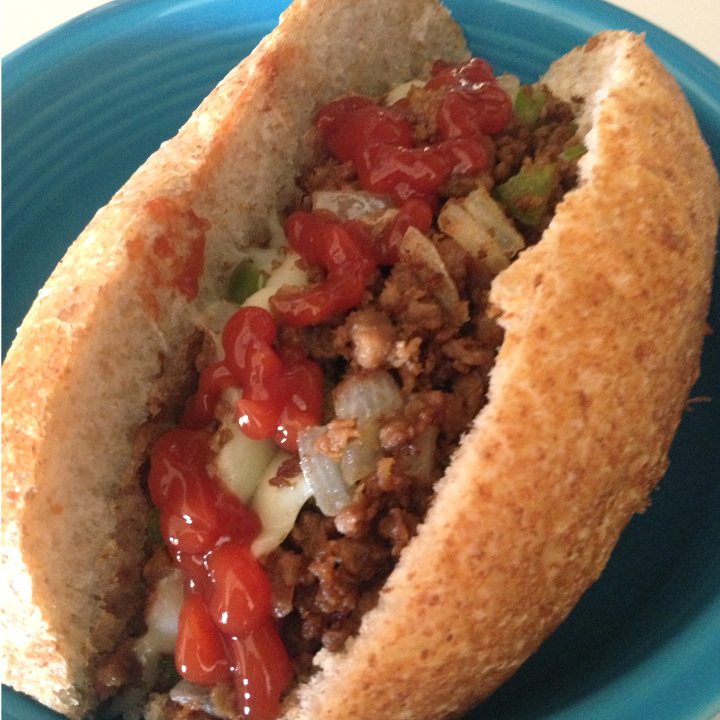 Top with Lightlife meatless crumbles, onions, peppers and a second slice of cheese. Place sandwiches on a baking sheet under a broiler for 1 minute – just until cheese melts on top. Serve with ketchup and enjoy!